The International Institute for Species Exploration at Arizona State University and a committee of scientists from around the world announced their picks for the top 10 new species described in 2011. This is the fifth year for the top 10 new species list, which was released May 23 to coincide with the anniversary of the birth of Carolus Linnaeus, the Swedish botanist who was responsible for the modern system of plant and animal names and classifications. “The top 10 is intended to bring attention to the biodiversity crisis and the unsung species explorers and museums who continue a 250-year tradition of discovering and describing the millions of kinds of plants, animals and microbes with whom we share this planet,” said Quentin Wheeler, an entomologist who directs the International Institute for Species Exploration at ASU. Members of the international committee who made their selection from more than 200 nominations look for “species that capture our attention because they are unusual or because they have traits that are bizarre,” said Mary Liz Jameson, an associate professor at Wichita State University who chaired the international selection committee. “Some of the new species have interesting names; some highlight what little we really know about our planet,” she said. 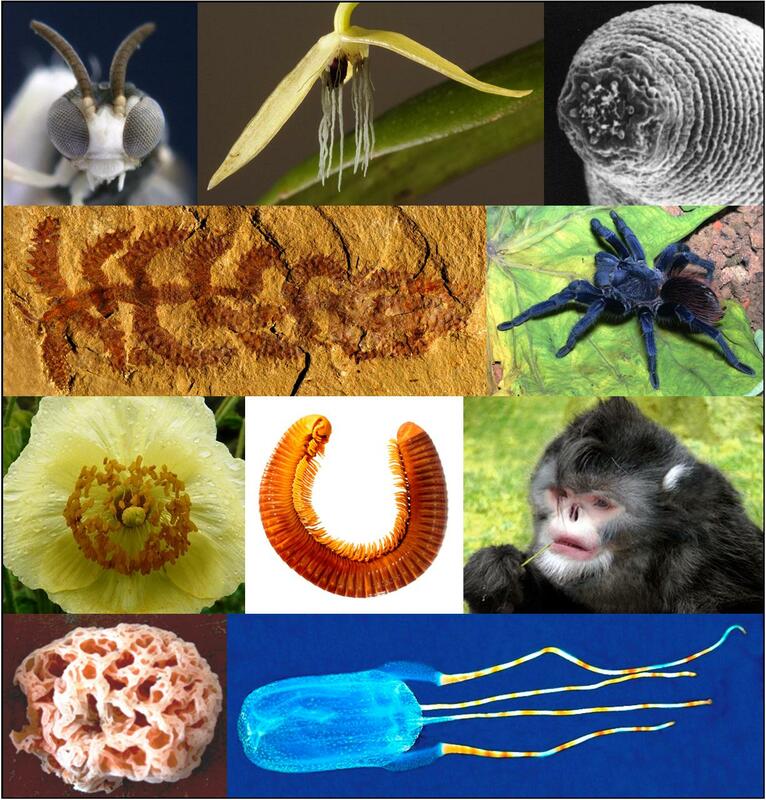 Images and other information about the top 10 new species, including the explorers who made the discoveries and recorded them in calendar year 2011, are online at http://species.asu.edu. Also at the site is a Google world map that pinpoints the location for each of the top 10 new species. This year’s top 10 come from Brazil, Myanmar, the Dutch Caribbean, South Africa, Papua New Guinea, Spain, Borneo, Nepal, China and Tanzania. Sneezing monkey: Since 2000, the number of mammals discovered each year averages about 36. So it was nothing to sneeze at when a new primate came to the attention of scientists conducting a gibbon survey in the high mountains of Myanmar (formerly Burma). Rhinopithecus strykeri, named in honor of Jon Stryker, president and founder of the Arcus Foundation, is the first snub-nosed monkey to be reported from Myanmar and is believed to be critically endangered. It is distinctive for its mostly black fur and white beard and for sneezing when it rains. A video of this species in on YouTube at http://www.youtube.com/watch?v=d1VuRvRv_UU. Bonaire banded box jelly: This strikingly beautiful yet venomous jellyfish looks like a box kite with colorful, long tails. The species name, Tamoya ohboya, was selected by a teacher as part of a citizen science project, assuming that people who are stung exclaim “Oh boy!” A video of the species, which has been spotted near the Dutch Caribbean island of Bonaire, is on YouTube at http://www.youtube.com/watch?v=PcraphPLAxY. Devil’s worm: Measuring about 0.5 millimeters (1/50 or 0.02 inches) these tiny nematodes are the deepest-living terrestrial multicellular organisms on the planet. They were discovered at a depth of 1.3 kilometers (8/10 mile) in a South African gold mine and given the name Halicephalobus mephisto in reference to the Faust legend of the devil because the new species is found at such a depth in the Earth’s crust and has survived immense underground pressure as well as high temperatures (37 degrees Celsius or 98.6 degrees Fahrenheit). According to its discoverers, carbon dating indicated that the borehole water where this species lives had not been in contact with Earth’s atmosphere for the last 4,000 to 6,000 years. Night-blooming orchid: A slender night stalker is one way to describe this rare orchid from Papua New Guinea whose flowers open around 10 at night and close early the next morning. It was described by scientists from the Royal Botanic Gardens, Kew and Leiden University, who named it Bulbophyllum nocturnum from the Latin word meaning “at night.” It is believed to be the first night-blooming orchid recorded among the more than 25,000 known species of orchids. Parasitic wasp: Ants beware! This new species of parasitic wasp cruises at just one centimeter (less than half an inch) above the ground in Madrid, Spain, in search of its target: ants. With a target in sight, the teensy wasp attacks from the air like a tiny dive bomber, depositing an egg in less than 1/20 of a second. A video of the wasp, named Kollasmosoma sentum, dropping an egg on its target is on YouTube at http://www.youtube.com/watch?v=bpMGhGMWaTA. SpongeBob SquarePants mushroom: Named Spongiforma squarepantsii, after the cartoon character SpongeBob SquarePants, this new fungus species looks more like a sponge than a typical mushroom. One of its characteristics is that its fruiting body can be squeezed like a sponge and bounce back to its normal size and shape. This fungus, which smells fruity, was discovered in forests on the island of Borneo in Malaysia. Giant millipede: A giant millipede about the length of a sausage bears the common name “wandering leg sausage,” which also is at the root of its Latin name: Crurifarcimen vagans. The species holds a new record as the largest millipede (16 centimeters or about 6.3 inches) found in one of the world’s biodiversity hotspots, Tanzania’s Eastern Arc Mountains. The new species is about 1.5 centimeter (0.6 inch) in diameter with 56 more or less podous rings, or body segments bearing ambulatory limbs, each with two pairs of legs. Walking cactus (lobopod fossil): Although this new species looks more like a “walking cactus” than an animal at first glance, Diania cactiformis belongs to an extinct group called the armoured Lobopodia, which had wormlike bodies and multiple pairs of legs. The fossil was discovered in Cambrian deposits about 520 million years old from southwestern China and is remarkable in its segmented legs that may indicate a common ancestry with arthropods, including insects and spiders. Sazima’s tarantula: Breathtakingly beautiful, this iridescent hairy blue tarantula is the first new animal species from Brazil to be named on the top 10 list. Pterinopelma sazimai is not the first or only blue tarantula but truly spectacular and from “island” ecosystems on flattop mountains. Why a top 10 new species list? “The more species we discover, the more amazing the biosphere proves to be, and the better prepared we are to face whatever environmental challenges lie ahead,” said the institute’s Wheeler, who also is a professor in ASU’s School of Sustainability and its School of Life Sciences. “It is impossible to do justice to the species discoveries made each year by singling out just 10. Imagine being handed 18,000 newly published books packed with fantastic information and stories and before having the opportunity to read them, being asked to pick the best 10,” Wheeler said. “With the help of an international committee of experts we do the best we can by picking those with flashy jackets, surprising titles and unexpected plot lines in an effort to draw attention to the whole lot. “There are many reasons to discover and describe species, and draw attention to this work. Perhaps most obvious is environmental: Unless we know what species exist to begin with, we are powerless to detect, track or mitigate losses of biodiversity,” said Wheeler. “Another is biomimetics, turning to species for clues about new and sustainable ways to meet our needs for survival, materials and designs. There is also an intergenerational ethical imperative for species exploration. Because human population levels and activities are driving extinctions, we owe to humans who follow to explore and document our flora and fauna. “Each species provides a unique chapter in the history of life and unless we discover them now, we stand to lose an enormous amount of irreplaceable evidence about our own origins and relatives,” said Wheeler, who is one of an international group of 39 scientists, scholars and engineers who provided a detailed plan in the March 30 issue of the journal Systematics and Biodiversity to chart 10 million species in less than 50 years, and called it a necessary step to sustain the planet’s biodiversity. The annual top 10 new species announcement commemorates the anniversary of the birth of Carolus Linnaeus, who initiated the modern system of plant and animal names and classifications. The 300th anniversary of his birth on May 23 was celebrated worldwide in 2007. Since Linnaeus initiated the modern systems for naming plants and animals in the 18th century, nearly 2 million species have been named, described and classified. Scientists estimate there are between 8 million and 100 million species on Earth, though most set the number between 8 million to 12 million. The list of the top 10 new species is issued annually by ASU’s International Institute for Species Exploration as part of its public awareness campaign to shine attention on biodiversity and the field of taxonomy. Previous top 10 lists are online at http://species.asu.edu. Nominations for this year’s top 10 list were invited through the species.asu.edu website and also generated by institute staff and committee members. “We had well over 200 new species nominated this year, and from those, we picked some fascinating “critters,” said Jameson. “Members on the committee come from many places around the world and from many backgrounds, so we bring our own biases to the process; some of us like photosynthesizers, some like predators, some like ocean dwelling critters,” she said. In addition to Jameson, a scarab expert, other members on this year’s committee included Philippe Bouchet, a marine life expert at the French National Museum of Natural History; Meg Daly, an expert in sea anemones at the Department of Evolution, Ecology and Organismal Biology, Ohio State University; Peter Kämpfer, who expertise is bacteria, Institut für Angewandte Mikrobiologie, Justus-Liebig-Universität Giessen; Niels Peder Kristensen, an expert in Lepidoptera and basal hexapods at the Natural History Museum of Denmark, Zoologisk Museum, University of Copenhagen; James Macklin, an expert on hawthorns and blackberries at the Agriculture and Agri-food Canada. Also, Ellinor Michel, a mollusk expert at the Department of Zoology, Natural History Museum, London; John Noyes, a chalcidoid wasp expert at the Department of Entomology, Natural History Museum, London; Alan Paton, who is an expert on mints at the International Plant Names Index and Royal Botanic Gardens, Kew, UK; Andrew Polaszek, an expert on Hymenoptera (parasitoid wasps) at the Department of Entomology, Natural History Museum, London; Gideon F. Smith, an expert on succulent plants at the Biosystematics Research and Biodiversity Collections, South African National Biodiversity Institute; Antonio Valdecasas, a water mite expert at the Museo Nacional Ciencias Naturales, Madrid, Spain; and Zhi-Qiang Zhang, a mite expert at the New Zealand Arthropod Collection, Landcare Research. Nominations for the 2013 list – for species described in 2012 – may be made online at http://species.asu.edu/species-nomination. In addition to the top 10 new species, the International Institute for Species Exploration annually issues an SOS – State of Observed Species – a report on human knowledge of Earth’s species. The latest report was released January 18 and is available online at http://species.asu.edu/SOS. ASU's Philip Christensen has been chosen as co-chairman of the recently established Committee on Astrobiology and Planetary Science. Philip Christensen, a Regents' Professor of Geological Sciences in Arizona State University's School of Earth and Space Exploration, has been chosen as co-chairman of the recently established Committee on Astrobiology and Planetary Science (CAPS). "The committee was created to support scientific progress in astrobiology and planetary science and to assist the federal government in integrating and planning programs in these fields," says Christensen. "It will provide an independent forum for identifying and discussing issues in astrobiology and planetary science." The committee holds its first meeting in Washington, D.C., May 23-25, 2012 – the agenda is downloadable from a link at the CAPS website given above. 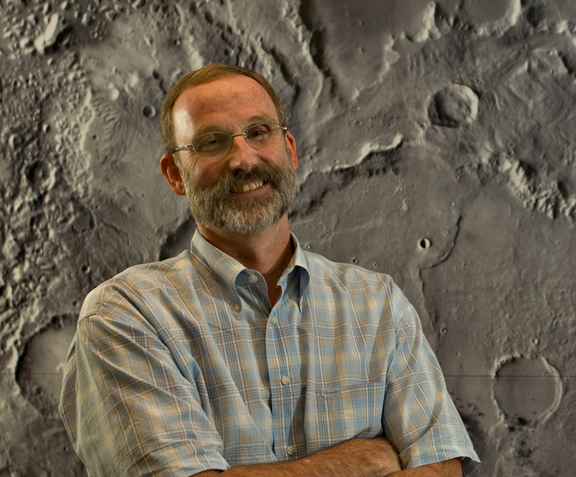 A planetary geologist since 1981, Christensen is director of the Mars Space Flight Facility on the Tempe campus and Principal Investigator for the Thermal Emission Imaging System (THEMIS), a 10-band infrared and visible camera on NASA's Mars Odyssey orbiter. He is also currently developing OTES, a mineral scouting spectrometer for NASA's OSIRIS-REx asteroid sample-return mission. The instrument will be built on the ASU campus. Christensen notes that one of the first tasks CAPS will undertake is evaluating NASA's revised plans for planetary science in light of the document Vision and Voyages for Planetary Science in the Decade 2013-2022. This document, published in 2011 by the National Academy of Sciences, came out of a once-a-decade survey process to identify the most important goals for planetary science over the following 10 years. In response to the President's proposed FY2013 budget, which sharply reduced spending on planetary exploration, NASA created program-planning groups for Mars and Europa to canvass their science communities and develop exploration plans for the next decade. These program-planning groups will release their preliminary reports in the next few months. CAPS will review the reports and give its assessment to NASA. "CAPS role is purely advisory," Christensen explains. "The committee contains a mix of planetary scientists and astrobiologists. Our aim is to provide solid advice to NASA and the federal government from experienced scientists working in the relevant fields."